Your leather interior deserves nothing but the best in leather care and conditioning. Wolfgang Leather Care Conditioner is a silky, lavish lotion that penetrates and nourishes leather of all ages, even surface- and vat-dyed leather. We cannot disclose the exact formula, but it does contain ingredients derived from nature, such as lanolin, mink oil and other natural oils--essential to the vibrant health and long life of your leather. Wolfgang Leather Conditioner preserves and protects leather from drying, cracking and brittleness that occurs naturally with age. Regular use of this lavish conditioner will leave your leather soft, supple and inviting. Our formula for Wolfgang Leather Care Conditioner results from many clinical studies of the world's best leather conditioners. Wolfgang set out to formulate a conditioner that would surpass all others in the following categories: longevity, absorption rate, realistic leather aroma, effectiveness on dry, stiff leather, surface enhancement, absence of residue, and overall quality. When our chemists presented their final product, we were ecstatic! Follow-up studies proved Wolfgang Leather Care Conditioner to be the irrefutable champion in leather care. You will love what it does to your seats and other leather surfaces! 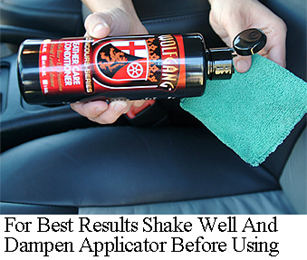 Specially formulated to resist stains and bead water armoring your leather! Nothing is better for your leather! Wolfgang Leather Care Conditioner matches the leather's own pH balance of seven for maximum conditioning. Botanical ingredients make up our conditioner, rather than drying petroleum distillates, which eventually dehydrate the leather and break-down the stitching. Tech note: Wolfgang Leather Care Conditioner should not be used on napped leathers like suede or glove soft-leathers. Leather that is in a hard, cracked condition cannot be restored by this product or any other means. Wolfgang Leather Care Conditioner 64 oz. Wolfgang Leather Care Conditioner 128 oz.